Connect with your struggling readers through high-interest supported reading. Developing fluency, enhancing vocabulary, and learning to habitually use reading comprehension strategies when interacting with text, can only be perfected through practice. The Scobre Press Reading Program has been developed as a tool for teachers to incorporate into their classrooms, enticing their most reluctant readers to read independently and practice the skills used by proficient readers. Using the graphic organizers in our Teacher’s Resource Guides as they read independently, struggling readers begin to improve comprehension, and ultimately, their love of reading. Each High Interest Book is available on two reading levels [break] By creating all of our titles on two reading levels, we are able to facilitate differentiated instruction in a classroom–reaching both your proficient and struggling readers with the same book. That’s right, the same book on two different reading levels! This allows students with varying reading proficiencies, but similar interests, to read the same book. Go Reader Digital Audio Players Plug into a new way of reading! The Go Reader is a portable reading-aid innovation from Book Buddy Digital Media — an MP3 audiobook that connects reading and listening in an exciting way, while scaffolding striving readers. Go Reader’s cutting-edge audio technology is simple, dynamic and ready to use the moment it arrives at your school. Scobre Press titles are now available on the Go Reader Classroom! Go Reader Classroom is a media player developed especially with education in mind. The audiobooks on this media player are intended to scaffold the learning process for striving readers as they participate in reading programs and literacy-building activities in their classrooms. 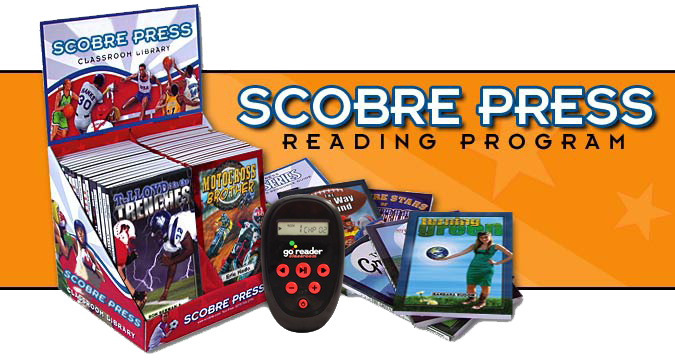 Each Scobre Press Go Reader Classroom comes pre-loaded with two complete books from the Scobre Press library—one at the Home Run reading level (3-4) and one at the Touchdown reading level (5-7) — so that both struggling and proficient readers can benefit from the same device. NEW! Two distinct resource guides to complement The Dream Series: Fiction titles and The Future Stars Series: Nonfiction titles separately! Used alongside either our high-interest fiction or nonfiction titles, the Scobre Press Teacher’s Resource Guides allow you to support your struggling and proficient readers by using the principles of differentiated instruction, while incorporating research-based strategies that get results. Every book in The Scobre Press Reading Program has been centered around a character education theme. Using The Scobre Press Teacher’s Resource Guide and The Scobre Press books in teaching about strong character will also have positive impacts on your students’ reading comprehension skills. Reading Comprehension and Writing Exercises are located inside of each book.